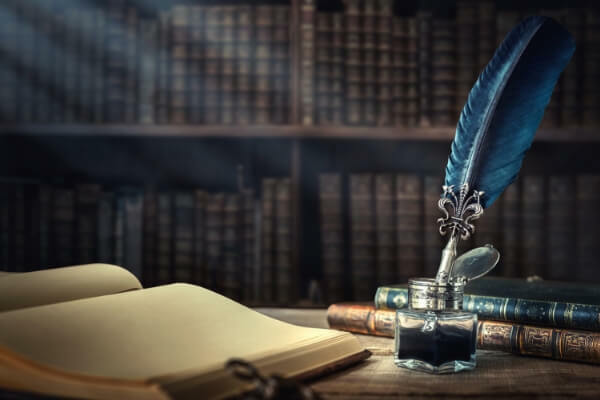 Getting guidance from those with supernatural gifts and a connection to the spirit world has been part of the fabric of daily life since well before the advent of the written word. Early humans looked to the stars in the night sky for guidance, and drew wisdom from communing with the spirits of their ancestors. The search for wisdom beyond the physical world remained part of human life throughout antiquity, providing much of the foundation of common human knowledge, long before the advent of modern science, ages before psychic readers began to counsel customers online. In ancient Egypt, high priests were part of the royal courts of pharaohs and the Book of the Dead was a cherished text that included spells to ease a dead person's journey through the underworld. In Greek mythology,“Psykhe”, the goddess of the soul, traveled to the underworld and back, her name coming from the Greek word for soul. Even after the advent of monotheism with the rise of Abrahamic religions, folk beliefs held strong, from the north African fear of the ayin (the evil eye) to the ancient west African spiritual traditions that spread Hoodoo and Voodoo across the New World. In Medieval Europe, what we know today as Tarot cards first became a popular past time and witchcraft, superstition, and folk medicine were treated with the utmost seriousness. In 16th century France, a boy named Michel de Nostredame was born in Provence, later becoming the famed astrologer and reputed seer, whose writings would become part of popular culture even centuries later. In modern times, the psychic readings of today began to take form. The spark came with 3 young sisters from Hydesville in upstate New York, who in 1848 began to make news for their alleged communications with a spirit that lived in their family home, becoming the first celebrity mediums. Though by 1888 the sisters admitted that it was all a hoax, by then they had already sparked a nationwide craze called “Modern Spiritualism,” which was focused on the belief that spirits of the deceased exist and can be communicated with. Across the country mediums began to hold seances, with Mary Todd Lincoln reportedly hosting seances in the White House—including with her husband present. Divining with the spirit world maintained a level of popularity throughout the early 20th century. 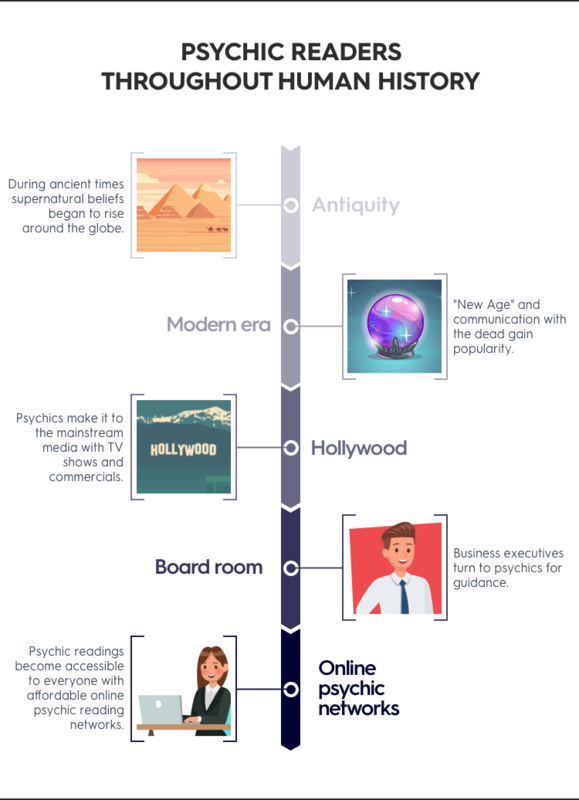 In the 60s and 70s, the rise of what came to be known as the New Age movement sparked an ever greater interest in spirituality and alternative medicine, as well as a variety of supernatural disciplines like channeling, astral projection, and mediumship. Few people have embraced psychic readings more than celebrities, and nowhere is this more true than in Hollywood. For year actress Shirley Maclaine has been known in large part for her new age beliefs, including that she lived in the mythic underwater world of Atlantis in a former life. MacLaine has written a number of books on spirituality and mysticism, and has also given interviews on numerous occasions about her reported UFO sightings. Perhaps the celebrity most associated with psychic readings is legendary singer Dionne Warwick, who in the 1990s began hosting infomercials for the Psychic Friends Network telephone service. Warwick made millions per year as the spokesperson for the telephone service for much of the 1990s. Today, millions of viewers tune in every week to watch “Hollywood Medium with Tyler Henry” on E!, and up until his death in 2016, “psychic to the stars” Ron Bard was highly sought after by Japanese business leaders, as well as superstar actor Brad Pitt. Aiden Chase, also known as “Hollywood’s healer” was the psychic and agent for The Hills star Heidi Montag, until she fired him in 2010 (he apparently didn’t see it coming). Renowned psychic medium James Van Praagh has been featured by comedian Chelsea Handler on her show Chelsea Lately, and Sarah Jessica Parker and her husband Matthew Broderick have reportedly used a psychic for marriage counseling. And while these business leaders may not talk about it publicly, in private they are willing to pay huge sums for the services of a trusted psychic advisor, with one “financial psychic” quoted in the article as saying that some clients pay as much as $10,000 per month for her services. Granted, $10,000 per month might be a little outside of your budget, but that doesn’t mean that a psychic reading is beyond your means. For a reasonable fee, you can get a session with a trained psychic reader by phone, text, or video chat—on your terms and when you like. It might not make you a celebrity, but you’ll join the timeless human legacy of looking for answers beyond the physical world.